Let the fun begin with the home recreation specialists at Game Tables Online.com! We carry a wide selection of indoor and outdoor game tables for hobbyists and home enthusiasts alike. Here you'll find everything to turn your game room into the ultimate experience. Browse our selection of foosball, pool, shuffleboard, air hockey, table tennis, multi-game tables and much more! We also carry outdoor sports equipment for games like basketball, volleyball, badminton, and bocce ball just to name a few. We believe that these activities build rapport at home and in the workplace. Game Tables Online is a strong supporter of youth sports and believes in giving back to the community. 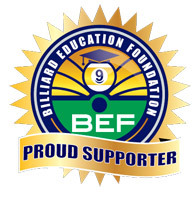 We're a Proud Supporter of the Billiard Education Foundation and Official Program Partner of the Jr. State Championships. Game Tables Online has been in business since 2008 and in this time we've supplied game room tables for many high profile institutions and commercial clients. We've worked with bars, hotel owners, housing authorities, and even retirement homes. No matter what you're looking for, we can accommodate you with just what you need. Whether it's an order for 10 tables or a single table for your home, we treat every order with a great deal of care. Every customer is important and customer service is a foundation in the Game Tables Online experience. So have a look around and if you have questions, contact one of our friendly Sales Staff by completing the contact form or by email at . If you'd like to speak with us by phone, we'd be happy to answer any of your questions by calling 1-888-565-7180 and we are here for you 7 days a week.